Jakarta, Indonesia: Policymakers and business leaders must quickly back a bold target to stop forest loss as part of efforts to conserve biodiversity and fight climate change, according to a new WWF report. Policymakers and business leaders must quickly back a bold target to stop forest loss as part of efforts to conserve biodiversity and fight climate change, according to a new WWF report. The first chapter of WWF’s Living Forests Report, released today, examines the drivers of deforestation and identifies the opportunities to shift from business as usual to a new model of sustainability, which can benefit government, business and communities. Based on a new global analysis showing that more than 230 million hectares of forest will disappear by 2050 if no action is taken, the report proposes that policymakers and businesses unite around a goal of zero net deforestation and forest degradation (ZNDD) by 2020 as a groundbreaking global benchmark to avoid dangerous climate change and curb biodiversity loss. The first chapter of the report comes as business and political leaders meet this week in Jakarta, Indonesia, for the Business 4 Environment Global Summit (B4E). The conference will be addressed by His Excellency Mr. Susilo Bambang Yudhoyono, President of the Republic of Indonesia. On the first day of the conference, businesses from the forestry, mining and palm oil sectors operating on the nearby island of Borneo will meet as part of WWF’s Heart of Borneo Green Business Network. At the summit, WWF will call on forestry companies to join the organization’s Global Forest & Trade Network, and also on other business sectors to support our goal in achieving certification of 75% of key global commodities in the region by 2020. More than 40% of the island’s forests are under concession to the private sector, with around 23% (6 million hectares) under management by the forestry industry. Carrefour, a leading retailer in Indonesia is answering this call by endorsing WWF’s Global Forest & Trade Network (GFTN). Today, the group’s two biggest suppliers for tissue paper in Indonesia, PT Graha Kerindo Utama and PT Graha Cemerlang Paper Utama are pledging to implement sustainable business under the Forest Stewardship Council (FSC). More businesses than ever before are working toward sustainable forest management, and governments are strengthening land use criteria and developing groundbreaking economic and fiscal incentives on the island, one of the most forest-rich places on the planet. On the ground, WWF and its local partners are developing pilot projects to demonstrate the feasibility of these approaches. 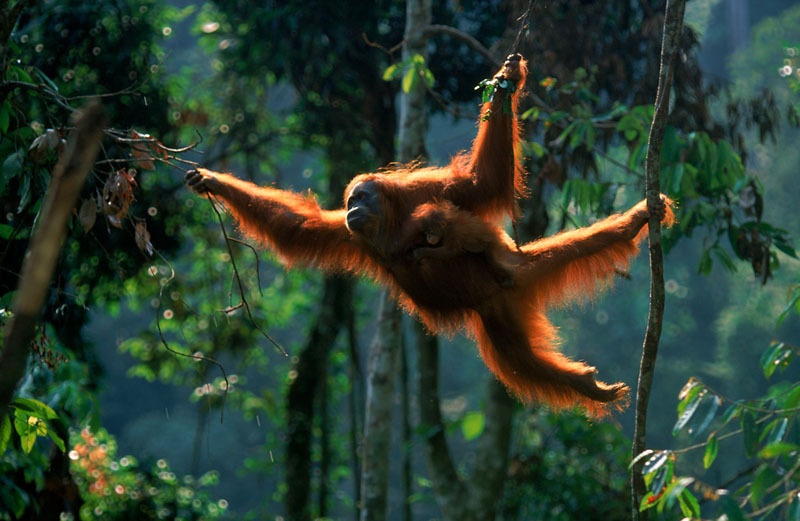 “In the Heart of Borneo, tangible examples of how these systems work are emerging. WWF-Indonesia acknowledges that sustainability does not occur overnight. We call on the business sector to join with us as we make the first steps on the road to a green economy and low carbon future, not just in Borneo, but in Sumatra and Papua as well – step by step,” said Dr. Efransjah, WWF-Indonesia CEO. Right now on the island of Borneo in a 220,000km2 area designated for conservation and sustainable development called the Heart of Borneo, these are the ideas being put into practice. Zero net deforestation and forest degradation by 2020 means no overall loss of forest area or forest quality, so a new monoculture plantation does not offset the loss of primary natural forest. The target requires the loss of natural or semi-natural forest to be reduced to near zero, down from the current 13 million hectares a year, and held at that level indefinitely. To understand what this would mean in practice, WWF developed the Living Forests Model with the International Institute for Applied Systems Analysis (IIASA), which forms the basis for the Living Forests Report. The Living Forests Model projects that by “doing nothing” we could lose more than 230 million hectares between now and 2050. “The Living Forests Model shows that conserving our forests is possible – and urgent. But it won’t be easy,” said Taylor. The report concludes that maintaining near zero forest loss in the longer term will require responses to rising pressures on forests due to demand for food, materials and fuel for a growing population, expected to hit 9 billion people by 2050. Additional chapters of the Living Forest Report will be released throughout the year to form a comprehensive analysis of the choices and decisions that must be made to secure a forested future for people and nature.